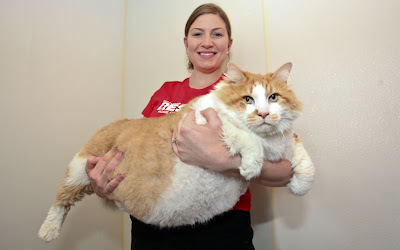 Could this be the world's fattest cat? Janet Ciminelli of North Shore Animal League of America in Long Island, New York, holds Garfield, a 40lb feline. The obese cat was brought into the animal rescue centre after his owner passed away. Staff have put him on a diet and are looking for a new owner who is committed to helping him become healthy and active.